Hey, y’all! Just bringing a quick lil post for ya today to share a few things! 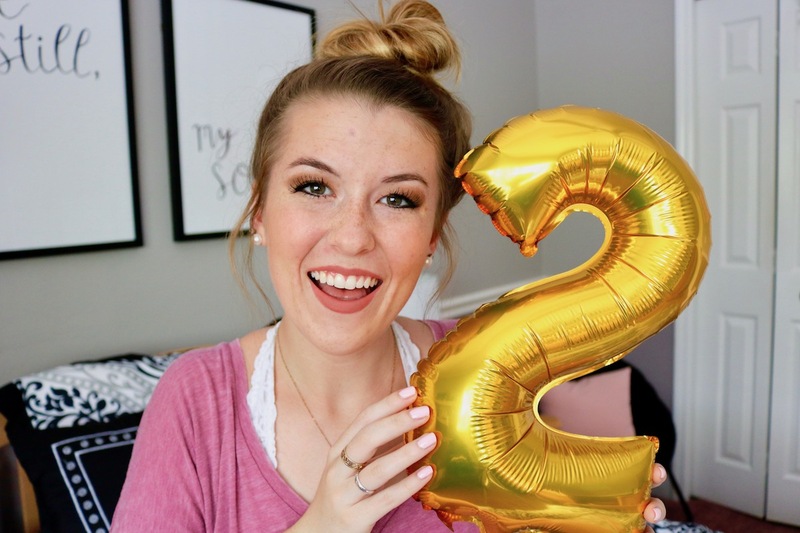 This whole week I’ve been celebrating two sweet years of this blog! I started KristenShane.com on August 14, 2016, and I haven’t looked back. I’ve been celebrating with cupcakes, confetti, and a giveaway happening on my Instagram (open until 8/10 at 12pm EST). I’ve already filmed a part 2 of this celebration with lessons I’ve learned from these two years blogging, and there will also be a quick Q+A coming your way! My giveaway is open until tomorrow, so I wanted to post this today, so you can enter if you haven’t already! I had another post planned & ready for today, but it can wait until the giveaway is over :). There will be two giveaway winners, and I’m giving away one of my favorite books I’ve read in 2018, so be sure to check it out! I’ve absolutely loved this blog and these two years. Another great big thank you to you, for being here and supporting me, and to all my lovely friends and family that are so encouraging and supportive of this great big passion of mine. I can’t wait to see where this next year takes me, and I’m already looking forward to a bigger and better blog celebration and giveaway next year! If you want to help celebrate, I’d love if you subscribed to my YouTube channel (which counts as a giveaway entry!!) or my email list below. Apparently, there’s a temporary issue with my email subscriber service, so I actually sent out my first real email to those who have subscribed, but apparently the email was sent to most people’s spam folders :(. The signup form still works, it’s just my ability to send y’all emails that’s down for now. I’m hoping this issue (and the issue shown by the ‘likes’ at the end of my posts) is resolved soon. Both these tech problems are unfortunately in the hands of the host companies and not mine, so I’m really hoping they’ll be fixed ASAP! As soon as my email service is good as new, you’ll be the first to know if you choose to subscribe! Congrats Kristen! Also, I totally agree about gaining confidence the longer you write. I can tell such a huge difference in my confidence and maturity from the time I started my blog to now. It’s so fun (and sometimes humorous) looking back! Yes, same here!! It’s crazy too sometimes because I’ll read something and not even remember writing it because so much has happened since then! It’s always fun to look back on though, which is another reason I love blogging!